A necklace is a fashion accessory of sorts that many people would love to have, especially the ladies, since it involves making the neck look a little bit more fashionable not to mention less bare, although a plunging v-line tends to draw the attention of one’s eyes elsewhere. 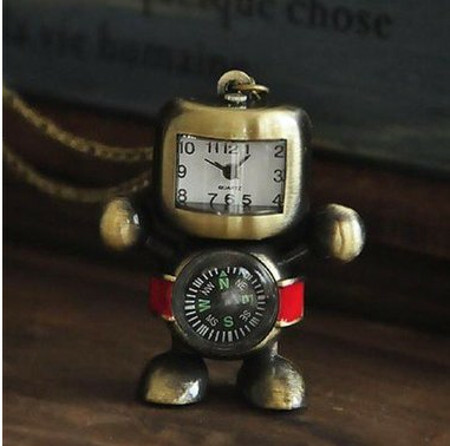 But I digress – the $14.99 Bot I Know Where We Are Necklace is an interesting addition, since it comes with a compass as the body – hence its name, and there is a clock as its head, which will also let you know of the time with but a simple glance. The chain itself measures approximately 31.5 inches long, while the pendant itself measures approximately 1.5 inches x 2 inches, and the entire shebang is made out of metal alloy, and will be water resistant. Good job!